April 25, 2018 April 25, 2018 by Emma S.
So you’ve dived deep into the world of our students, you’ve got a flavour of the latest marketing insights so it’s about time that we focus on the people that made the Masters in Digital Marketing happen. Our lecturers. If you haven’t already check out their Digital Scot profiles. So without further ado, meet Simone Kurtzke, Jack Keenan and Elliot Pirie. Simone: Anyone who is driven and who cares. At various times in life, you’ll encounter people who derive an imagined authority from their status or position in a hierarchy, and they think you’ll follow them because they’re above you. That’s just a big turn-off (sorry folks!). I really value authenticity and a genuine desire to connect, and I love to rally around a cause or mission with like-minded people, to make it happen. Tribes FTW! Growing up, my role models were often women, but actually, everyone has a spark (whatever their gender/nationality /whatnot / I don’t care – we’re all humans). Jack: In life, Kilian Jornet, an amazing runner and mountaineer, he might be superhuman but he also reminds me that even huge obstacles can be overcome through determination and perseverance. In terms of people I admire in relation the areas I teach on….. I really like the work of people like Andy Kirk or David McCandless, both great designers that reveal the stories in data. Elliot: My dad (Professor Ian Pirie); his continued drive and determination to explore new technologies and their uses, both in a consumer and pedagogical (educational), context puts my own to shame. What do you do outside of the industry? 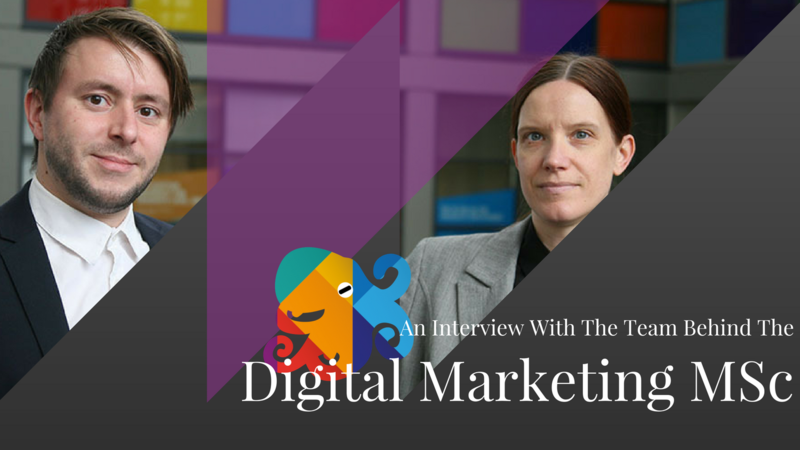 Simone: First of all – I LOVE the digital marketing industry! I’ve found it to be one of the most inclusive work environments out there. Originally I was drawn to it for its ability to embrace – and reward – geeks. It is no surprise then that outside the industry, I do some geeky things such as playing video games. I’ve been a PlayStation gamer for a long time. I was part of a small number of beta-testers for the PS2 online gaming service in 2002 or 2003, testing SOCOM: US Navy Seals and Twisted Metal: Black Online for SCEE (Sony Computer Entertainment Europe). I’ve been blown away by amazing games over the years (across multiple consoles, handhelds and PC), and can’t get enough of the creativity that’s part of gaming culture. Gems such as the original Jak & Daxter, Ico, Bastion, Limbo, Journey, Rayman Origins, or Zelda: The Minish Cap have enriched my life in a way that other cultural forms such as film don’t really come close to. Right now I’m playing indie game Terraria, replaying Zelda: Link to the Past (Game Boy Advance), while waiting for Kingdom Hearts 3 (PS4) to hopefully be released later this year. Jack: I lecture in different areas, as well as teaching on topics relating to digital marketing I teach about film, particularly documentary. I am a keen trail and ultra runner and spend a lot of my time clocking up miles, as well as running I enjoy cooking, art, film, music, good beer and chess. Elliot: Outside of work, and when I have the time(! ), I am a keen guitarist. Having worked in the Musical Instrument trade for 15 years before turning to academia, I have amassed a reasonable collection of high-end instruments and assorted goodies, retiring to the man-cave and playing for a few hours is a great way to unwind. What advice would you give to someone who wants to get involved with the industry? Competition for jobs, in general, is much fiercer today than it was a decade or two ago, and the digital marketing industry is no different. As a jack-of-all-trades but master of none, you may find it harder to add value than if you have deep expertise in one or two areas. Most of my own career has been built on this – deep expertise in one or two areas at a time when very few people had the same set of knowledge and skills. Many jobs in this (and other) industries are never publicly advertised. One of the best ways to find out about these ‘unofficial’ digital marketing opportunities (be it jobs, placements, internships, or short-term/freelance projects) is through networking – both online and offline. You may be surprised that offline and face-to-face is still one of the best ways to put yourself on the map, so if you live your life on social media but find it difficult to communicate and interact in the real world, then work on those skills. Online personal branding helps too of course! I’m pretty much self-taught when it comes to digital. In the 90s, you didn’t have Content Management Systems such as WordPress. If you wanted a website, you had to build it from scratch in HTML. There were tons more barriers out there than there are today; even sending email under Unix using the Pine email client was a bit of a challenge and not for everyone. If you wanted to create anything on the internet, you had to figure it all out yourself – there were no YouTube tutorials as YouTube didn’t exist! It taught me that self-directed, proactive learning is critical to mastering tech and digital skills. This is no less true today given the fast-paced nature of change – I LOVE teaching myself new stuff and so should you if you want to succeed in this industry. Jack: That depends on where they want to specialise. The main thing you need to do is get some experience whilst developing the skills that employers are looking for. This is why we have taken a practice-based approach to the MSc allowing students to demonstrate not just their understanding of the key concepts that underpin Digital Marketing, but their ability to apply those concepts to real-world challenges. Elliot: Employers are increasingly reliant on and in search for digital skills, whether this is in a marketing or wider context, so developing a portfolio of evidence is crucial: you need to be able to demonstrate your previous work, i.e. helping a friend start their business by building their website, having your own blog, having your own videos you’ve edited for a charity, anything that is ‘real’ will ultimately demonstrate your talents to prospective employers. What are your most memorable moments of Digital Marketing? Simone: My most memorable moment was when, while working as Social Media Manager at VisitScotland, our ‘Shetland Ponies in Cardigans’ campaign nearly took down the website when suddenly going viral back in 2013. This was a truly collaborative effort between our PR and digital teams – with the PR team coming up with the idea and pushing it out to their media contacts, and the digital team ensuring it got significant traction and shares on social, as well as plenty of blog and influencer coverage resulting in high domain authority backlinks to our site. Read more in my Operation Shetland Ponies interview on the Digitals Awards storybook. Elliot: I still think the Airbnb ‘we accept’ campaign was very special, given its timing, political ramifications and capitalizing on the (at the time) trending issue…. As for my geekier side, the Eggo / Stranger Things collaboration was pretty cool. What do you see being the next biggest Digital Marketing trend in 2019? Simone: GDPR. It’s not a trend as such, but the impact of GDPR, especially on the traditional staple of brands’ lead generation activities such as prize draws, ‘free’ WiFi (free if you sign up to our enewsletter…), will definitely be a big thing not just in 2018. I’m curious to see how brands big and small will tackle this challenge in creative ways in 2019, and how they’ll react to complaints (I’m looking at you, Scotrail – your pre-ticked opt-in when buying train tickets is not compliant and you’ll be hearing from me on 23 May 2018!). On a slightly unrelated and more long-term note, I am excited about Androids. There’s this guy in Japan, Hiroshi Ishiguro, who’s created this quite advanced Android called Erica, as well as some kind of replica of his own head. While neither is yet anywhere close to what we see in Blade Runner or Westworld, it does give you a taste of things to come. When it does, I think I’ll be rather keen on getting to know (and maybe even make friends with) a few select Androids. Can’t wait! Jack: I think that we’ll continue to see the increasing significance of Data Analytics supporting marketing decisions. Machine Learning is already applied in a range of contexts. I expect this will become more widespread though as new platforms and software make it easier for organisations to apply Machine Learning and other analytic techniques to business problems. Elliot: The increasing use of analytics and audience insight to inform our business decision making will continue to have a huge impact within Digital Marketing. Meanwhile, influencer marketing is gaining further traction and popularity, so keep an eye on both in 2019.